I’ve already listed specs, and shown a few pictures of Kingnovel K-R68 (R6) Android media player based on the latest Rockchip RK3288 quad core processor. I’ve now gone through all my usual tests, so today, I’ll write the review, going through the user interface, testing video playback, reporting one various performance benchmarks including network and storage performance, tested most hardware features, and played a few games. Albeit there’s an infrared remote control with the device. 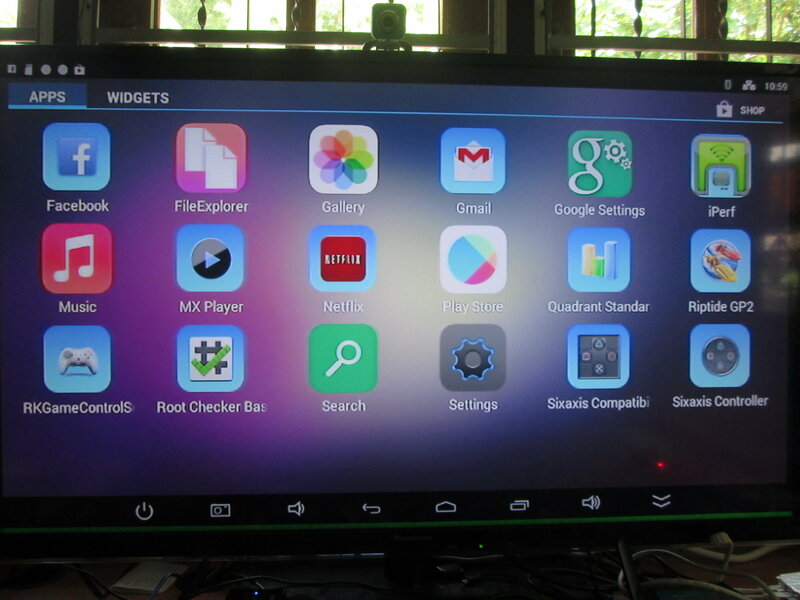 I’ve not used it all, especially, as we’ll see below the default user interface is the stock Android home screen. As usual, I’ve connected an RF dongle to use Mele F10 Deluxe air mouse. Before powering up the device, I’ve also connected an HDMI cable, a USB hard drive, and an Ethernet cable. Albeit there’s a power button, the device will boot automatically as you connect the power adapter, and the boot completes in just over 20 seconds. The status bar is shown by default with a power (Standby or Reboot) button, volume buttons, the back, home, and app list icons, as well as an icon to hide the status bar. I’ve enabled the screenshot button in the settings. The user interface defaults to Chinese as shown in the screenshot above, so I had to go to the settings to change the language. The resolution was set to 1920×1080. The Settings are basically the same as Uyesee G1H, but with some colorful icons on the left, instead of the usual black and white icons, and there’s no “Home” to select between launchers. The Wireless and Networks section features Wi-Fi, Bluetooth, Ethernet, and Data Usage sections, as well as a “More” section with VPN, Portable Hotspot and so on. You can choose between “Default Output” (PCM / Down-mixing), “Spdif Passthough”, and “HDMI Bitstream” (HDMI pass-through) in the sound settings, (Not tested, as I don’t have audio receiver). The Display settings include options to adjust for overscan, select HDMI, YPbPr, and “TV” (Composite) video output, as well as the resolution: “auto”, 1080p 24/25/30/50/60Hz, 720p 50/60, 720×576 or 720×480. Again it’s exactly as the previous RK3288 sample I tested (G1H). 4K options should also show if the box is connected to 4K TV, Most of the tests have been done using HDMI output, but I also tested composite and component (YPbPr) video outputs. Composite works, but in NTSC mode I had a green line on the bottom, which I could not hide with the “Screen Scale” menu. I had no such problem in PAL mode. I had the same problem with Component (YPbpr) output as with my other RK3288 device, as only the Chrominance signal would apparently be displayed. 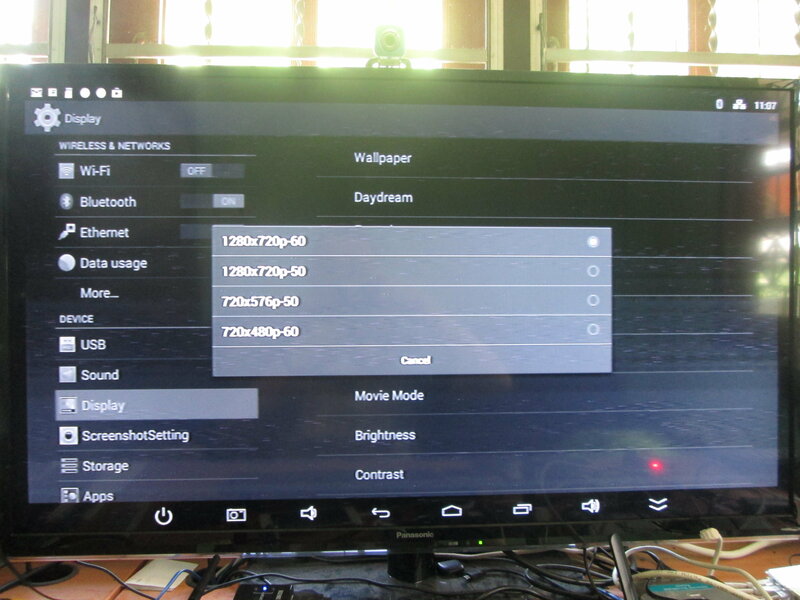 Resolutions selectable with YPbPr are only 720p, 720×576 (PAL) and 720×470 (NTSC), and there’s no option for 1080p. K-R68 features a 8GB eMMC flash partitioned with a 1.91GB “Internal Storage” partition for apps with 1.53 GB free, and a 4.27 GB “NAND FLASH” partition for data. A single partition for apps and data would be ideal, but this partitioning should work fine for most people. The “About device” section reports the model number as “rk3288”, Android 4.4.2 on top of Linux kernel 3.10.0. The firmware is not rooted, and I don’t have male to male USB cable, so I could not root it via the OTG port. In this review, I won’t show a video of the settings and user interface, because it’s just the same as Uyesee G1H, apart from a different home screen (pictured above), and colorful icons in the settings menus. Google Play Store works as expected, and I could install most apps such as ES File Explorer, MX Player, Antutu, Quadrant, Beach Buggy Blitz, etc… and even paid apps such as Sixaxis Controller installed properly. Vidonn activity tracker app was reported as “incompatible with your device”. I also installed Amazon AppStore after downloading it via the stock browser, and loaded Riptide GP2 on the device. The firmware is stable and fast. I had no reboot and hang ups during my testing. Thanks to fast eMMC, apps loading times can be impressive, for example XBMC loads in less than 2 seconds, and I never had slowdowns as experience in Uyesee G1H while installing apps. The user interface resolution is 1080p by default, but if you want some extra performance for some games for example, you can switch to 720p if you wish. Contrary to Uyesee G1H, Kingnovel K-R68 comes pre-loaded with XBMC. So I played videos from a SAMBA share over Ethernet using XBMC, only switching to MX Player in case of issues. I had problems with Gigabit Ethernet again (instability), so I used a 10/100M hub between the device and my Gigabit switch (D-Link DSG-1005A), and the connection was perfectly stable. So all results are based on XBMC playback unless otherwise stated. XBMC – OK, but smoothness could be better. So XBMC can’t play H.265, no VC1 videos, and MPEG-2 play, but are not super smooth. hddvd_demo_17.5Mbps_1080p_VC1.mkv (17.5Mbps) – Audio only (That’s the VC1 codec issue in XBMC). Sintel-Bluray.iso Blu-ray ISO file could play just fine in XBMC. XBMC – OK most of the time, but skips about 60 frames at the end of the video (The image will freeze before the end of the video). XBMC – Played in slow motion, unwatchable. Jockey_3840x2160_120fps_420_8bit_HEVC_TS.ts – Plays with S/W decode (MX Player reports codec not supported by H/W). Finally, I played some Several AVI, MKV, FLV, VOB and MP4 videos in my library. Most could play, but several had audio/video sync issues, a number of FLV videos could not play at all, and one XVID video had lot of frames skipped during playback. A complete 1080p video (1h50) could be played in XBMC without issues. 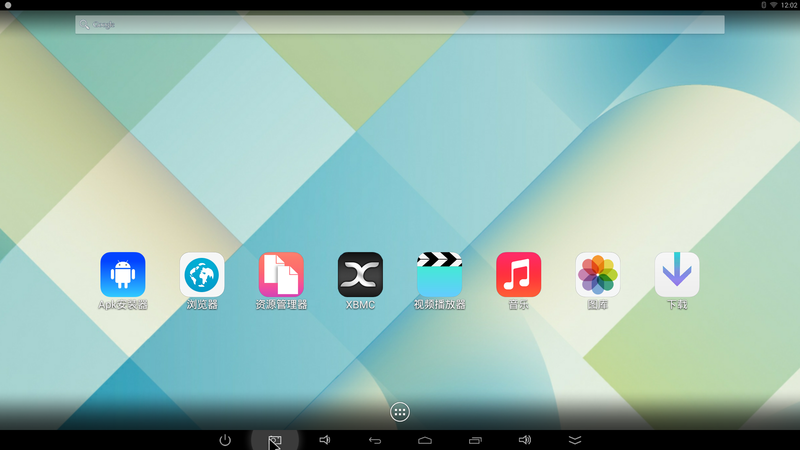 Once XBMC refused to exit, as clicking on the exit button did not work at all, but I could not reproduce the issue. Overall, the XBMC experience is disappointing, but if you combine MX Player and XBMC capabilities most videos can be played. The network test consists in transferring a 278 MB file between a SAMBA share and the internal flash, and vice versa, repeating the test three times using ES File Explorer. Wi-Fi performance is excellent and very consistent, as transfer times were all between 1m42s and 1m44s, averaging a cool 2.69 MB/s. While I’m with Wi-Fi testing, I also ran Rockchip’s “Wi-Fi display” app, but even though the display was detected by my phone and “successfully” connected, mirroring did not work at all. I tried several times, but my subsequent attempt all failed to connect at all. As mentioned previously, I had stability problems (again) with Gigabit Ethernet, so I could only properly test Fast Ethernet performance. 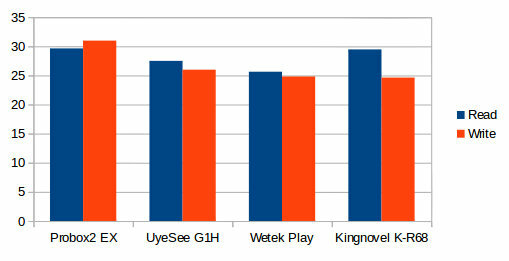 Using the same test procedure as Wi-Fi, K-R68 shows very good performance compared to other solutions I’ve tested. This test is not a pure network performance test, as it may be affected by storage write performance. Having said that, I’ve experience similar results writing to flash or USB hard drive for all devices under test. I’ve tried different Cat5e Ethernet cable with it did not solve the issue. 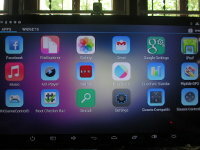 I could easily pair K-R68 to my Android smartphone (ThL W200) over Bluetooth, and transfer a picture. Vidonn X5 activity tracker suppoert Bluetooth 4.0 LE, so I installed the Android app, and successfully connected to my wristband to get the data. I’ve also connected my USB 3.0 hard drive with NTFS, EXT-4, FAT32, and BTRFS partitions, and as usual only NTFS and FAT32 could be mounted automatically. A1 SD Bench was run to benchmark the NTFS partition (/mnt/usb_storage/USB_DISK2/USB3_NTFS). The read speed was 29.47MB/s, and the write speed of 24.63MB/s, both of which are pretty consistent with the results achieved with other devices, albeit the write speed was the weakest of the products tested by a small margin. 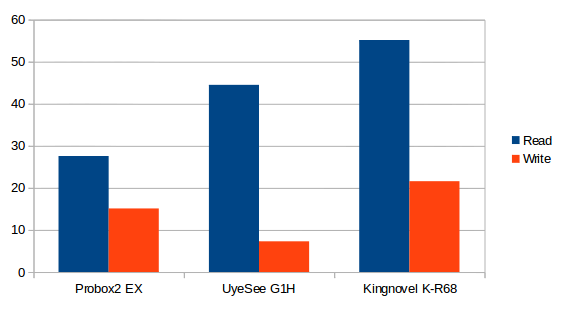 The internal storage read and write speeds are very important to apps loading time, and overall system performance, and K-R68 excels in this benchmark, at least compared to Uyesee G1H, and Probox2 EX. The fast eMMC write speed explains why I never felt slowdowns during my testing, contrary to what happened with G1H. Using a white brand UVC USB webcam with built-in microphone. I could test audio successfully with the Echo service in Skype, and I could see the video, but as I tried to leave a video message, the app exited. Google Hangouts could detect the webcam (Video icon at the top right of the screen), and I could start a video call, but the webcam image was not shown. I’ve tested three games: Candy Crush Saga, Beach Buggy Blitz, and Riptide GP2. I played Candy Crush Saga with my air mouse, and used Tronsmart Mars G01 wireless gamepad in the two other games. Beach Buggy Blitz was super smooth even with graphics settings maxed out and 1080p resolution, and Riptide GP2 was very smooth most of the time, and albeit not perfect, RK3288 devices are a massive jump in terms of playability compared to earlier generation of chip, and even Amlogic S802. I’ve also tested stability by playing Riptide GP2 for 30 consecutive minutes, and everything runs fine, but the bottom of the device can get pretty hot (Over 75 °C). Thanks to the rubber pads, it does not touch the table though. The top is much cooler at around 55 °C. CPU-Z app returns the exact same data as for G1H TV box, that is a Rockchip processor with four Cortex A12 cores @ 126 MHz to 1.80 GHz with a Mali-T764 processor. Only the firmware version differs. G1H got 39,273 in Antutu 4.x @ 1080p resolution. Since them Android 5 has been released, and K-R68 got 37,428 points between Redmi Note (MediaTek MT6592) and Xiaomi Mi3 (Qualcomm Snapdragon 800). Results between Antutu 4.x and Antutu 5.x are not directly comparable. I had no luck with Quadrant, as I was greeted with gray screen when I wanted to start the test. I’ve run Ice Storm Extreme test in 3DMark to see if there was any improvement compared to G1H score. 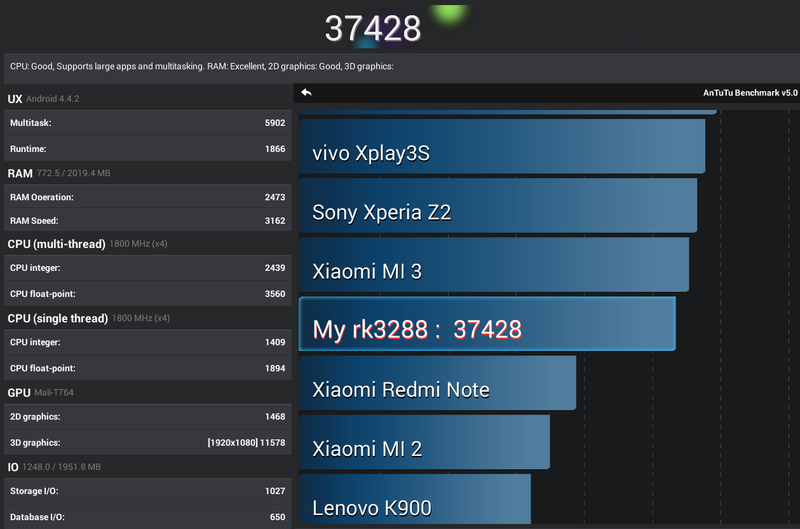 A score of 7,531 points, is only slightly higher than than 7,278 points achieved by G1H, and is about the same as the one achieved on a smartphone based on Qualcomm Snapdragon 801. However many recent devices based on Qualcomm 800 and greater get a score above 10,000 or simply maxes out the test. Kingnovel K-R68 hardware has massive potential with a fast processor, outstanding 3D performance, and excellent Wi-Fi and eMMC storage performance. 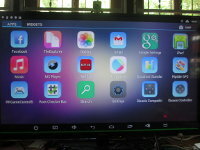 The firmware is stable and provides a smooth experience, but if you are looking for a device well supported by XBMC, it’s not there yet. Having said that, I’ve only tested the XBMC version provided with the sample (Gotham 13.2), and there are some version that may have better support include HEVC hardware decoding such as Beyond XBMC 3.4 (beta) and an XBMC version released for Firefly-RK3288 development board. Fast eMMC, both for reading and writing speeds. Video Output – 1080p support 24, 25 ,30 , 50 and 60 Hz output which may be important for some videos. 4K @ 60Hz should be supported thanks to HDMI 2.0 (not tested). Potential Gigabit Ethernet issues, at least confirmed with my switch (D-Link DSG-1005A). The enclosure (bottom) can get pretty hot, with temperatures over 75+ C after long periods of 3D gaming. Video output – Component only output the Luminance signal with my TV, composite (NTSC) has a green bar at the bottom, no problem for PAL. If you are a distributor, you may want to visit Kingnovel K-R68 page for some details, and possibly contact the company. The box does not seem to be selling on e-retailer sites yet, or it’s sold under another model name. The box appears to be sold on Geekbuying under the model name R6 for $107.99. I thinks the same model is sold in geekbuying but it’s called R6. ‘Webcam supported in Skype (although it did seem to work Google Hangouts)’? Is the wifi test on 2.4ghz or 5ghz. If first one, can the 5ghz performance be tested? Tested with 2.4Ghz, I have ordered a new router on Aliexpress that supports 5GHz (including ac), so I should be able to test it in a few weeks. K-R68 does not support 802.11ac despite what the specs say on their website, simply because it’s using AP6330 Wi-Fi module. Many manufacturers are wrong about this, so if you want a device with 802.11ac, make sure it comes with AP6335 module. ir remote does not work unless you stand 2 meters on front of the box any further and it does not work and i did a test using es file manager transferring from my nas using the 5ghz and got speeds of 4MB/s at the moment my only problem is webcam iam using logitec c920 that works with beelink r89. Somehow my android stich switched to German. How do I switch it back to English?